I have to confess that the reason I haven’t been blogging as much of late is because I haven’t been crocheting or knitting as much as usual. The knitting I have going is a design so that “can’t” be posted. But the real reason is that my interest has turned to my first love of drawing and painting. Towards the end of May, I happened upon a book by Peter Reynolds called Ish. It unleashed my drawing block, and I’ve been ishfully sketching away in little books, taking them with me on trips, jotting down the beauty I see from my morning walks, etc. An old feeling of “wholeness” has been stealing over me ever since. 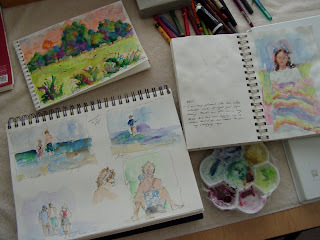 A sketchbook is a wonderful thing: there is no performing for anyone, no need to be technically correct, no “have-to’s” or “shoulds”, no pressure to make “real” art. Ahhh, what a feeling! I have actually worked on a “larger sketch” or two–one of my son skateboarding and one of my youngest with a pink umbrella, but these are for me to enjoy and not for others, or for sale, or for exhibit. Just for fun. I have been sewing a skirt for myself out of leftover fabrics and trimmings…just for fun. And the last few evenings, I have added a few rows to a ripple crocheted afghan I have going…just for fun too. Summer is a good time for just-for-funness…I hope I can carry it with me into the fall as well.